Nov. 10, 2017 8:20 a.m.
Efforts to reach an agreement this weekend on a Pacific Rim trade pact appeared to collapse Friday when persistent concerns over the deal, including Canada’s, forced the abrupt cancellation of a scheduled leaders’ meeting. Some international media quickly blamed Prime Minister Justin Trudeau for the meeting’s sudden cancellation. The heads of the 11 countries that have been negotiating a revised Trans-Pacific Partnership had planned to meet on the sidelines of the Asia-Pacific Economic Co-operation leaders’ summit in Danang, Vietnam. Trudeau did not go to the conference room at the scheduled time to meet the other TPP leaders. However, the Prime Minister’s Office insisted that Canada was not the only country to raise concerns. A spokeswoman said Japanese Prime Minister Shinzo Abe, the meeting’s chair, cancelled the event after a 50-minute face-to-face discussion with Trudeau. A report in Australia’s Sydney Morning Herald said Trudeau “sabotaged” the talks at the last minute by failing to show up for the meeting. The New Zealand Herald reported that Trudeau’s ”no-show” had delayed TPP talks indefinitely. Canada’s foreign affairs minister said Ottawa is still at the TPP negotiating table and it doesn’t want to rush on such a complex deal. “I’m not going to speculate on what other countries might say,” Chrystia Freeland said when asked about the allegations that Canada is holding up the TPP. She also suggested Canada wasn’t the only one to blame for Friday’s cancellation. “There are a few countries who continue to have some important issues that they would like to be addressed,” Freeland said. Freeland refused to share details on Canada’s concerns over the TPP, saying it was International Trade Minister Francois-Philippe Champagne’s file. She added that he wasn’t available to speak to reporters Friday because he was back at the TPP bargaining table with other trade ministers. Canada’s resistance to the new TPP does not come out entirely of the blue. 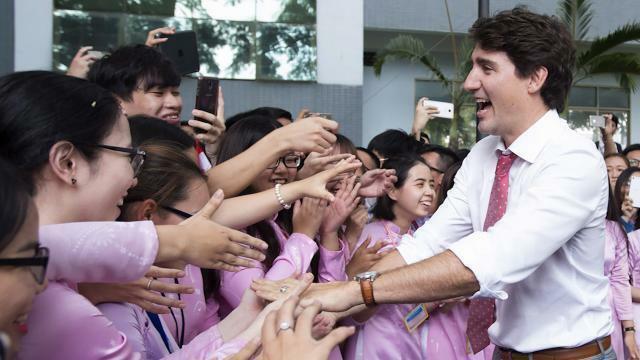 Over the past week as talk of some kind of deal grew louder, senior officials and Trudeau alike have talked about wanting to roll back concessions made during the broader TPP talks when the United States was still involved. In particular, they point to a need for stronger protections for Canadian culture, supply management and intellectual property. At the same time, Canada has been pushing to add new elements to the revised TPP, including provisions for gender, environment and labour. Heading into the APEC summit, some countries had expected an agreement. The 11 remaining TPP countries have been working to revive the deal, which was abandoned earlier this year by U.S. President Donald Trump. Earlier this week, Trudeau said wasn’t going to be pressured into committing to an agreement “at all costs” and that it would have to address the best interests of Canadians. A senior government official says Japan has been one of the countries applying pressure on Canada to come to an agreement on an updated TPP. Trudeau’s lengthy bilateral discussion with Abe started before the meeting’s cancellation. Canada and Japan, the two largest economies at the TPP talks, appeared to have different expectations ahead of Friday’s scheduled negotiations. Late Thursday, Trudeau’s Liberal government flatly denied media reports quoting Japan’s economy minister saying that a “deal in principle” had been reached on the TPP. “Despite reports, there is no agreement in principle on TPP,” Champagne tweeted late Thursday. Champagne and Freeland were in the room for Friday’s Trudeau-Abe meeting. “We are still negotiating — this is a very, very complex negotiation,” Freeland said.